The preservation of Art and Heritage pieces is a matter of urgency as they are continuously eroded by the elements. AGS Records Management has years of experience in heritage imaging and know how to take care of your valuables. Don’t let your most precious items become irreparably damaged. AGS Records Management is used to handling art and heritage items, we are experts in imaging these important documents. AGS Records Management has all the resources and experience to handle your heritage imaging and ensures you the best results. Get in contact with one of our experts who will give you professional advice. Digitized imaging will give your heritage pieces a new breath of life and ensure it can be enjoyed by yourself and others for many more years to come. In today’s fast paced world, electronic forms of medium are far easier to access, for a larger number of people, and in wider geographical locations – so you can share the joy you gain from the piece easily! Preparation (dust-removal, de-conditioning/ reconditioning, archive capturing, taking inventory) and digital document storage requires skill. The choice of scanner and accessories to be used is determined by each document’s characteristics. Specific procedures and equipment are used according to the type and nature of the document. We also provide advice on the appropriate storage and transfer methods for your digital data. Process and optimise images to make the information more easily accessible through key words, image type, or geographical searches. We edit images (touch up, image optimisation, OCR or text/image segmentation, incorporation of metadata or copyrights) to enrich the content. Our solution offers automatic or semi-automatic control and an ability to statistically analyse whether the brief matches the service that was rendered. Share your heritage documents thanks to our online digital library, which offers greater access to the information. Enhance your digital documents with distribution solutions (interactive databases, interoperability, search engine) with hosting included. The digitisation of your heritage collections means that the public now can have access to historic documents. We have developed our own in-house solutions which are available in either internet or intranet mode, with secure access. We assist you in selecting the best solution for your heritage collections, offering various digitisation forms including, digital library, interactive slab, 3D booklet, connected e-book, guided tour and scenography. 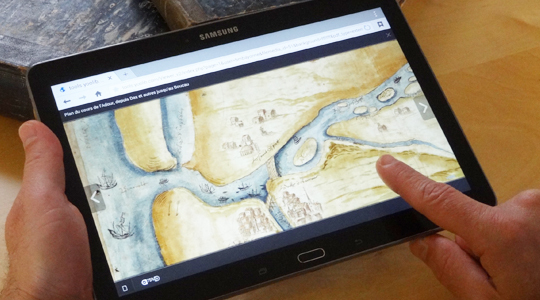 With Limb Gallery, our digital-library, your audience will be able to observe, in detail, your heritage collections via a simple computer screen or tablet.